St. Kitts and Nevis is an island nation with 56,000 inhabitants, has an area of 269 km² (104 mi²) and is one of the 12 smallest states in the world. 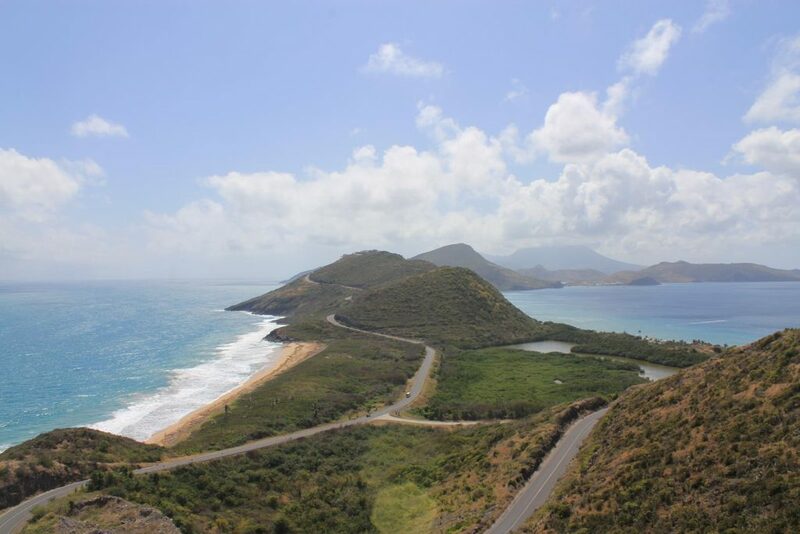 St. Kitts (also known as Saint Christopher) is the more populous island, separated by a three-kilometer-long canal from Nevis (11,500 inhabitants across 93 km²/ 36 mi²). During the last ice age, the sea level was about 60 m lower and Nevis, St. Kitts, St. Eustatius and Saba formed a contiguous, large island. The distance from St. Kitts to the north-west island of Saba is about 60 kilometers (37 mi). Sint Eustatius can be reached after about 25 kilometers/ 15 miles. As sugar exports have collapsed in recent decades, the government decided to quit in 2005. This plunged the country into a crisis and led to a reorientation of the economy. The new source of income is tourism, as the branch is growing faster and faster. Between 2007 and 2009, the country was able to increase its visitors from 350,000 to 590,000. In addition, citizenship can be obtained easily through an application and a bigger investment. As a special feature, St Kitts offers the opportunity to take a sightseeing tour by train. Built from 1912 to 1926, the railway has a total length of 29 km, runs along the coast and offers beautiful views of the nature and the sea. The route was built specifically for sugar production and was used to transport the sugar cane to the factory in Basseterre, the island federation´s capital. Other attractions include Romney Manor, the Brimstone Hill Fortress and the Berkeley Memorial. The Memorial is a circus modeled after the Piccadilly Circus in London. Romney Manor is a kind of botanical garden with a beautiful view and some on-site batik artists selling their products. The Brimstone Hill Fortress is a 16th-century fortress, designed by the British and built by slaves. We visited the first two mentioned. Both are worth a detour. For the castle, unfortunately, the little time on the island was simply not enough. We visited the ruins of a sugar factory instead and enjoyed the sun. Like everywhere in the Caribbean, the beaches look fantastic. The only drawback: That day, the sand was too hot to walk barefoot – nice! On the last day of our cruise we docked in Sint Maarten/ Saint Martin. Everybody who has seen a television report about aircrafts starting and landing just a few feet above the heads of tourists on a gorgeous beach. This is the island – read more in my next post!